John Douglas Edward Henry Campbell, 7th Duke of Argyll FRS FRSE (21 December 1777 – 25 April 1847), known as Lord John Campbell until 1839, was a Scottish peer and Whig politician. Campbell was born in London, the third son of John Campbell, 5th Duke of Argyll. His mother was Elizabeth Campbell, 1st Baroness Hamilton of Hameldon, who had been ennobled in her own right in 1776. Campbell was baptised on 18 January 1778 at St James's in Westminster. He was educated privately and later attended Christ Church, Oxford. In 1803, he travelled to Paris, where he met Talleyrand as well as Napoleon; Campbell returned to England the following year. He succeeded his older brother George Campbell, 6th Duke of Argyll in his titles in 1839. Campbell was commissioned into the British Army in 1797 as an ensign of the 3rd Foot Guards, commanded by his father. He purchased a lieutenancy in 1799 and shortly afterwards became a captain. During the French Revolutionary Wars, Campbell served in the Netherlands under orders of Sir Ralph Abercromby. He retired in 1801 forced by ill health and after two years was appointed lieutenant-colonel and commandant of the Argyll Volunteers. Following the rearrangement of the country's militias in 1809, he became colonel of the Argyll and Bute Militia. He entered the British House of Commons in 1799, having been elected for Argyllshire as replacement for his uncle Lord Frederick Campbell. After the Act of Union 1801, he continued to represent the constituency also in the new Parliament of the United Kingdom until 1822. He was elected a fellow of the Royal Society in 1819. Campbell was nominated Keeper of the Great Seal of Scotland in 1841, an office he held for the next five years. Argyll married firstly Elizabeth, eldest daughter of William Campbell against the wishes of his father in 1802. They were divorced six years later having had no children. Lady Emma Augusta Campbell (1825 – 30 May 1893) she married Rt. Hon. Sir John McNeill on 26 August 1870. After his second wife's death in 1828, Argyll married thirdly Anne, eldest daughter of John Cuninghame in 1831. She was the widow of George Cunningham Monteath. Argyll died, aged 69, in Inveraray Castle in Argyllshire and was buried at Kilmun Parish Church. Having been predeceased by his older son John in 1837, he was succeeded in the dukedom and his other titles by his second son George. He was survived by his third wife until 1874. ^ "Library and Archive catalogue". Royal Society. Retrieved 5 January 2010. Cokayne, George Edward (1910). Vicary Gibbs (ed.). The Complete Peerage of England, Scotland, Ireland, Great Britain and the United Kingdom. vol. I. London: The St Catherine Press Ltd.
Douglas, Sir Robert (1904). Sir James Balfour Paul (ed.). The Scots Peerage. vol. I. Edinburgh: David Douglas. Thorne, R. G. (1986). The House of Commons, 1790–1820. vol. I. London: Secker & Warburg. ISBN 0-436-52101-6. Burke, John (2001). Peter de Vere Beauclerk-Dewar (ed.). Burke's Landed Gentry of Great Britain. Wilmington, Delaware: Burke's Peerage and Gentry Llc. ISBN 0-9711966-0-5. Dodd, Charles Roger (1846). The Peerage, Baronetage and Knightage of Great Britain and Ireland. London: Whitaker and Co.
F. and J. Rivington, ed. (1848). The Annual Register 1847. London: George Woodfall and Son. George John Douglas Campbell, 8th Duke of Argyll,, styled Marquess of Lorne until 1847, was a Scottish peer and Liberal politician as well as a writer on science, religion, and the politics of the 19th century. Torquhil Ian Campbell, 13th and 6th Duke of Argyll, styled as Earl of Campbell before 1973 and as Marquess of Lorne between 1973 and 2001, is a Scottish peer. Baron Hamilton of Hameldon, of Hambledon in the County of Leicester, is a title in the Peerage of Great Britain, held by the Duke of Hamilton from 1790 to 1799 and by the Duke of Argyll since 1799. Elizabeth Georgiana Campbell, Duchess of Argyll was a British noblewoman and abolitionist. Born into the wealthy Sutherland-Leveson-Gower family, she was the eldest daughter of the 2nd Duke of Sutherland by his wife, the political hostess Lady Harriet Howard. In 1844 Elizabeth married George Campbell, Marquess of Lorne, eldest son and heir to the 7th Duke of Argyll. She became the Duchess of Argyll in 1847 when her husband succeeded his father. Henry Scott, 3rd Duke of Buccleuch and 5th Duke of Queensberry KG KT FRSE was a Scottish nobleman and long-time friend of Sir Walter Scott. 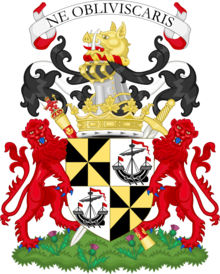 He is the paternal 3rd great-grandfather of Princess Alice, Duchess of Gloucester, and the maternal 4th great-grandfather of Prince William of Gloucester and Prince Richard, Duke of Gloucester. George William Campbell, 6th Duke of Argyll GCH, PC, styled Earl of Campbell from 1768 to 1770 and Marquess of Lorne from 1770 to 1806, was a Scottish Whig politician and nobleman. Niall Diarmid Campbell, 10th and 3rd Duke of Argyll was a Scottish peer and historian. Carter-Campbell of Possil is a branch of Clan Campbell, a Scottish clan. Historically, they are part of Clan Campbell, which was regarded as one of the largest Scottish clans. The branch of the Campbell clan was historically centred in Lawers. Some of the clan, which originated with the original Campbells, had links to the lands of Argyll. William Keith, 4th Earl Marischal was a Scottish nobleman and politician. General Duncan Campbell of Lochnell was a Scottish soldier and Whig politician from Argyll. An officer in the Duke of Argyll's regiment of the British Army, he sat in the House of Commons for nine years in the interest of George Campbell, 6th Duke of Argyll.